Don't let a lackluster web presence ruin relationships with your prospective tech buyers before they've even begun. Learn what matters most – and how to maximize your site's potential! It sounds crazy but it’s true—once a prospect arrives at your website, you only have ten seconds to make them want to stay. If your tech company’s online presence isn’t impressing them at first glance, they’re going to bounce. 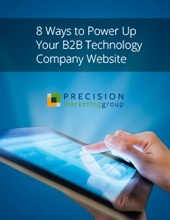 Engaging readers in ten seconds seems like a tall order, but when marketing to B2B buyers who are looking for high quality technology products and SaaS offerings, there are a number of relatively simple changes you can make to your website to build trust and satisfy their digital needs. The “F” reading rule for content… and more! Plus, you’ll receive insider tips on how to address these aspects of your website, as well as a checklist to help you organize and track your progress. It’s a big, bad World Wide Web out there, and there are so many other companies vying for your target audience’s business. Let’s make your website speak volumes to break through that noise. Simply fill out the brief form and our free guide is all yours!